This is my new custom page. My old one became cluttered with lower quality, unplaytested customs, so I'm having a fresh start with (hopefully)higher quality customs. If you want to play test my customs, feel free! If you could post the results of your play test, that would be appreciated! My old customs (Which I made with my brother) can be found here. Normally, on Feyland, cremation was reserved for the noblest of warriors. These were not normal circumstances. The body was laid out on a stone slab, with a blanket of wood on top of it. Even though he was dead, the sight of him still shot fear into the hearts of those present. Bogdan, the Necromancer. Three years ago, he had betrayed his kind, making an alliance with the wolves of Nastruland and supplying them with an undead army. He had once been the best of the elves, teaching all elves who came to him the sacred art of magic. Now he was the icon of death, he was what children were afraid would come out of their closets, he was the worst enemy of his own kind. How had it come to this? Those standing around his lifeless body thought. How could our greatest hero turn to the dark arts to satisfy his need for power? How could one so great still want so much more than he had? One week ago, all that was left of the elven forces had attacked Bogdan’s castle fortress, pushing as hard as they could, wanting the dreadful war to end. Hundreds had died that day. Hundreds more wounded. But in one final push, they broke through the undead forces. By the end of the day, Bogdan was dead. And now they were to burn his body, to make sure that he never came back. “Might as well get this over with.” Their leader produced a torch from his bag, lighting it with a snap of his fingers. He held the torch to the kindling, and the room erupted in flames. A high pitched shriek enveloped the room, as if the necromancer could feel the flames destroying his body. The elves present covered their ears, trying to shield themselves from the horrible noise, but it pierced through straight to their hearts, and there was no way they could get away from it. After several long minutes, they looked up in agony as the smoke cleared, revealing that the body was incinerated. But the shrill noise continued. But if Bogdan is dead and gone, They wondered, What is that noise? As if in answer to their thoughts, the stone slab began to shift and reform, mixing with the ashes of the Necromancer, twisting and contorting as if something was trying to break free from it, until it finally began to take shape, as if invisible hands were shaping clay, forming into the shape a hideous Gargoyle. It was then that they began to realize that the noise was not screaming. It was laughter. The noise ceased as the Gargoyle finished forming, spreading it's stone wings out across the sky. It turned it’s blood red eyes on the elves, a crooked smile on his stone mouth, revealing it's many sharp teeth. Then Bogdan uttered a single word. 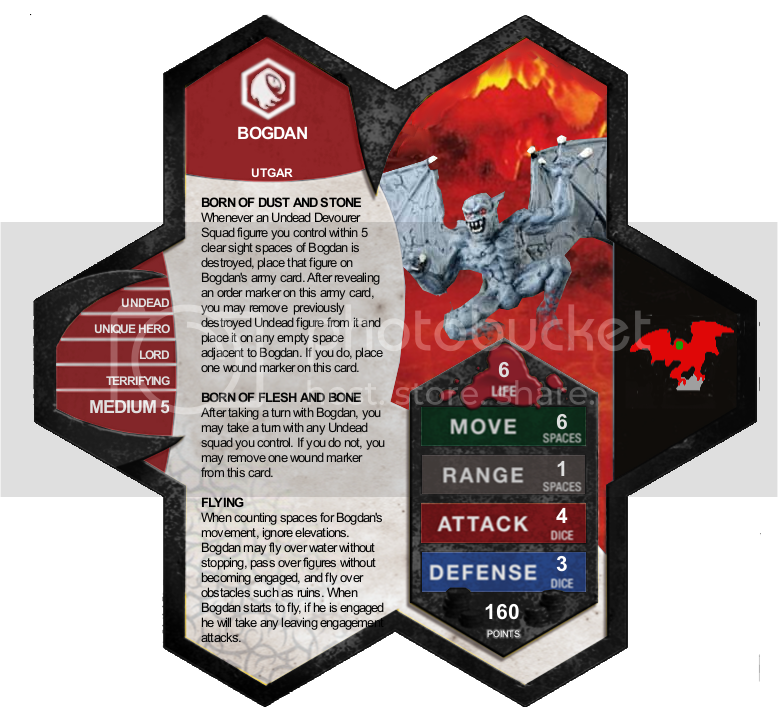 Miniature used: Gargoyle, from Reaper's Legendary Encounter set. A: Making the Rechets more viable. B: Paving the way for more undead devourers. C: Creating a general figure for the undead. As I continue to play test, I will see if he meets these goals. Agent Carr had worked with many different types of people when he had been on earth, but no one came even close to the frostragers that Vydar had sent with him on this mission. There were two of them, and both remained silent as they sat around the campfire. It wasn't the scilence that bothered Carr, no, he had worked with many silent agents in his time, but it was the look that the one called Evar gave him. He just stared at Agent Carr like there was nothing he wanted more than to tear him up into tiny pieces. Finally, after two hours of scilence, Carr couldn't stand it any more. "Do you have a problem, Scarcarver?" Carr glared back at him. Evar did not answer. "I asked if you had a problem." This time, the other one answered. "He doesn't cope well outside of battle." This was Kurr Iceslicer, the other frostrager Vydar had sent. "What is his his problem with me?" Carr asked. "He has anger issues." Kurr answered. "If I were you, I would thank him." "Thank him for what?" This time Evar answered. "I am using every bit of my willpower not to kill you, Carr." He spoke through gritted teeth. Carr took a step back and drew his sword. "I'd like to see you try." Kurr walked in between Evar and Carr. "Don't entice him, Carr. Frostragers hold an anger that few can control." "You seem to be doing fine." Carr pointed out. "I've had the rage longer. I know how to direct it." Kurr answered. "But you cross me, and I'll kill you in a second, I don't care if Vydar put you in charge." The two warriors glared at eachother, each daring the other with their eyes, daring him to make the first move. Carr was considering whacking him upside the head with his sword, just to teach him a lesson about authority, when Evar spoke. "They're coming." He was looking down the mountain, watching a legion of marro march toward them. Carr estimated about fifty drones, but he saw the real target in the back. Tul-Bak-Ra. "One one thousand, two one thousand, three one thousand-" Agent Carr counted under his breath. At fifteen one thousand, the entire first and half of second row of marro Drones fell dead. Every couple seconds, more Drones fell. Kurr looked impressed. "Microcorp are pretty good shots." "-Thirty one thousand. Let's move out." Carr said. The two Frostragers and Agent Carr ran down the mountain toward the army of Drones, leaping from ledge to ledge. Agent fired a few shots into the swarms, but he had his eyes on the real prize. The Marro Overlord. As soon as they hit the army Agent Carr was dodging the passing attacks of Drones weaving through the army like a phantom. He glanced back to see Kurr and Evar covering his back, Evar taking the bulk of the hits. But for every wound Evar took, more and more dead Drones piled up. Then they were behind the army. They had plowed right through it, just like they were supposed to. And there was Tul-Bak-Ra. "Vydar wants us to-" Agent Carr started to say, but Evar yelled and attacked the Overlord with all he had before he could finish. With a brilliant flash of light, four Marro Warriors appeared at the Overlord's side, defending him with their large blasters. Kurr got hit in the shoulder, and any mask of calmness he had worn immediately vanished. He jumped up and yelled firing shards of ice all across the battlefield. One Warrior tried to fight back, but Kurr dodged the blast easily, and countered with a volley of ice shards. Within seconds, the Warriors were dead, all felled beneath the deadly rage of Kurr Iceslicer. Kurr turned to Tul-Bak-Ra. "Now if you'll listen. We can give our message. And let you go." The Marro Overlord looked confused at this statement. Agent Carr stepped forward. "Vydar would to propose a deal to your General." "What kind of deal?" Tul-Bak-Ra answered. "The stab Jandar in the back kind." Kurr said with a sinister smile. The figure is Xeph Soulknife, from the D&D set Giants of Legend. 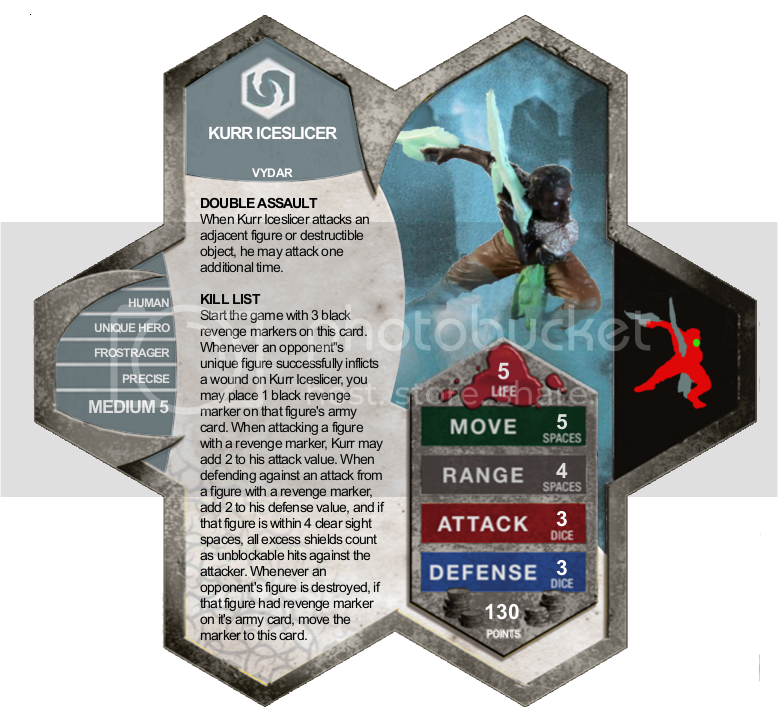 When making Kurr, I wanted to create a new frostrager that captured the risk-taking-will-he-die-or-will-he-kill-my-opponents-most-powerful-heroes moments, but not be just a clone of Evar. I came up with the idea to essentially let your opponents choose who he slaughters. Or he could just be overrun by commons. That works too. "Are you ready?" The question was three words, but it was far from simple. So the recipient countered with another question. "What will happen to me?" It was fair enough, wanting to know what would happen to him. "You, who are no one, will become no one, and therefore someone." It was the same answer he had received last time he had asked. "Are you ready?" The question was asked again. He cleared all doubts from his mind, and then answered. "Then let us commence the ceremony." They began chanting in words far too old and powerful for him to understand, speaking with authority, confidence. Then, almost as soon as the chanting had begun, it stopped. That's strange. He thought. I don't feel different. Then his universe exploded, and he saw through dozens of eyes, and he realized that mere seconds ago, he had been no one. But now he was the order. The order was him. He was someone. "You are Lerkintin, just like the rest of us." "Your old identity is useless to you. Forget about it." "Your given name will be Arkmer, meaning ‘different’. Is that name agreeable?" Of course he agreed, for it made no sense to disagree with yourself. 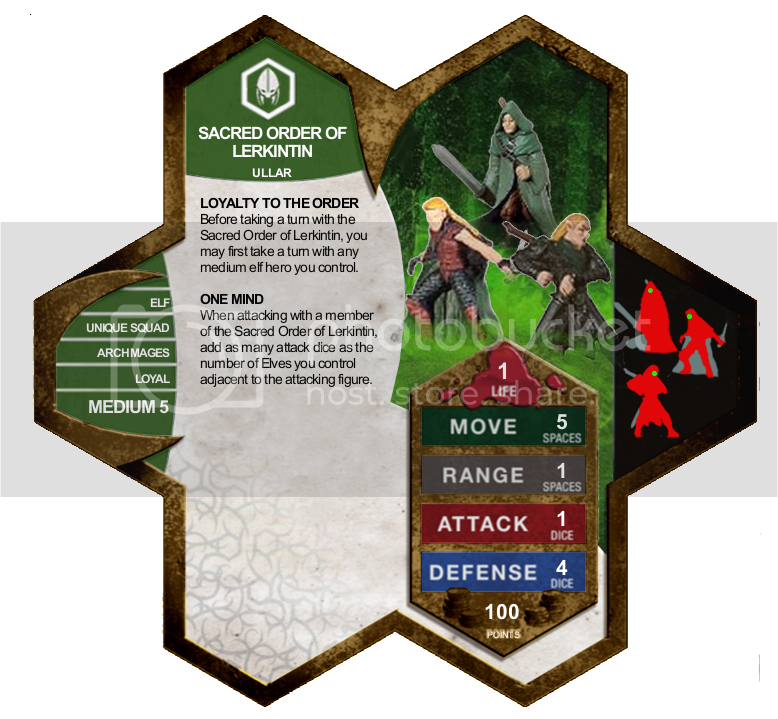 "Welcome to the Sacred Order of Lerkintin, Arkmer." Devis, half elf bard, from the Harbinger set. Deepshadow elf, from the Giants of Legend set. Elf Stalker, from the Underdark set. The point of this squad is to (hopefully) make overpriced elf heroes like Sonlen and Syvarris more viable, and also make it possible to make a new type of elf army, not themed nearly entirely off wizards. Last edited by Evar-Scarcarver; February 27th, 2014 at 10:37 PM. Seems like a unit that you'd sit behind the front lines and allow to direct the battle. The ability to regenerate (at the cost of forgoing offensive punch for that turn) is cool, especially when coupled with his ability to resurrect Retchets at the cost of a wound. Points look about right, maybe on the high side. But then again, he does make for a somewhat formidable-looking general. 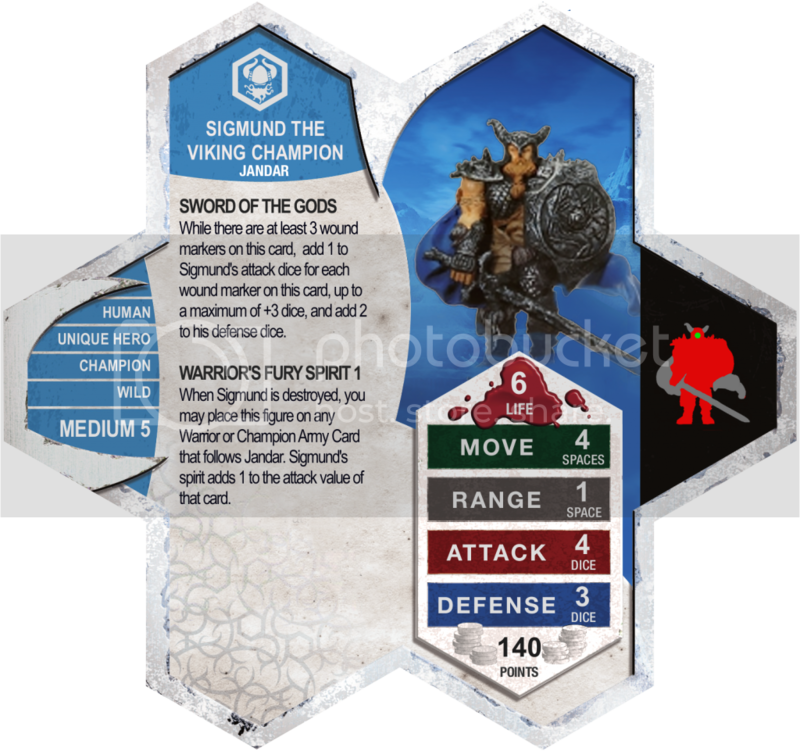 6 Life allows you to gamble with wounding, resurrecting, regenerating and attacking just enough that he won't go down early to an off-the-wall attack. I'd watch carefully to make sure he doesn't overpower Iskra or the Retchets. The ability to resurrect a Retchet, then take a turn with the squad itself is potent, since you only pay 50 points for the Retchets in the first place. 3 Defense will be his most limiting factor (good thing too). I noticed a definite theme issue and probable gameplay issue; Marcu is an Undead Devourer. Perhaps a Squad limitation or something? Last edited by awesomeunleashed; June 30th, 2013 at 08:55 AM. Reason: Cool idea, though. I noticed that soon after uploading the card, and have since then been debating whether or not this makes Marcu overpowered. I think the theme works, (with a small stretch) Bogdan being a necromancer, but I'm probably going to have to make it squads only. I like the start. I think he is a bit overpriced, since Iskra and Rechets aren't great right now, but I really like both powers and the theme. I think he would work well as a lord for Skeleton synergy. I've considered making him a lord, but I'm not sure if that works thematically. I figure if you use him with the Rechets and Skeletons, that gives you reason to keep Iskra alive. Making his "Born of Dust and Stone" power not work on Marcu. Lowering his price by 20 or 30 points. Then I'll probably get started on playtesting. Added two new customs and updated Bogdan's card. I will not be adding any more customs until I have play tested these ones. Bogdan seems to basically guarantee there will never be an Undead Devourer Unique Hero. Don't you want to limit it to Squad figures or at least Unique Squad figures instead? I actually meant to do that. I seriously doubt Shades are "Born of Dust and Stone." Any ideas what I could change it to that would make sense with the shades and still sound cool? On the other hand, should I make that ability not effect the shades?